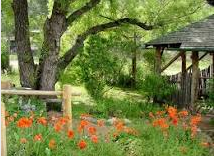 All the beauty that surrounds us in the Colorado foothills is underpinned with the stewardship of generations past. From the earliest of times as Indian hunting grounds to settlers who worked their ranches to Denver aristocrats with summer retreats, the wildlife and natural beauty endures. 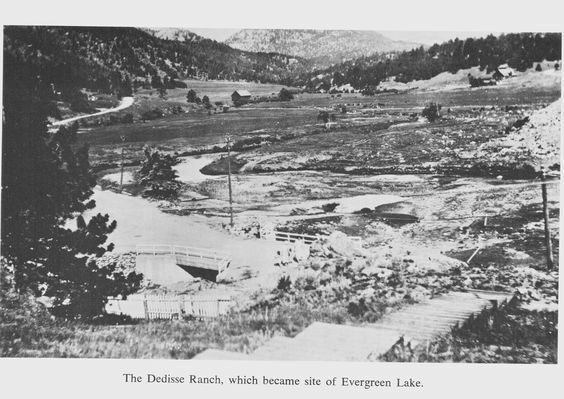 Homesteader Thomas Cunningham Bergen arrived in 1859, establishing a ranch and stage stop north of present-day downtown Evergreen. He built a cabin in the valley known as Elk Park, in the middle of the summer hunting grounds for the Ute and Sioux bands. The Bergen Park settlement was situated along the Mount Vernon toll road to the mining districts. The Bergen home was expanded and provided a meal and night’s lodging for $1.00 for weary travelers and freighters. When the Evergreen Township survey was completed in 1861, the government’s land became available for homesteading in 160-acre parcels and settlers were required to file their homestead with Jefferson County. In 1862 Amos Post built a general store near Bergen’s lodging house, and, with Bergen, built Evergreen’s first school. By 1877, Post opened a trading post, called “The Post,” along the banks of Bear Creek. 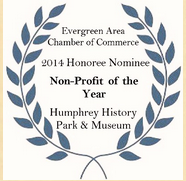 A number of stage stops and lodging houses sprang up in Bear Creek Canyon and in the area now known as Evergreen. Subsequent settlers homesteaded south of Bergen along Bear Creek Canyon and the downtown area grew around the confluence of Cub Creek and Bear Creek. 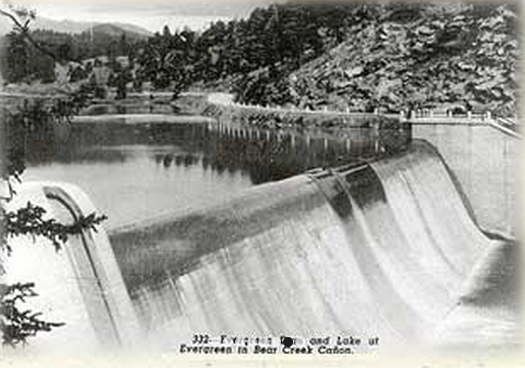 The Evergreen Dam was built in 1925-1926 which created Evergreen Lake. In 1943 Darst Buchanan bought 1,000 acres from Ted Johnson. 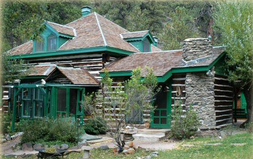 Buchanan was the owner of Hiwan Ranch, including what is now the Hiwan Homestead Museum. Buchanan gradually amassed a ranching property of 10,000 acres and bred prize-winning Hereford cattle on his Hiwan Ranch. 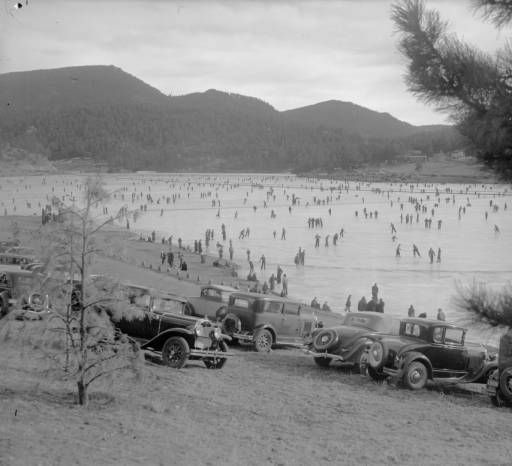 In 1945, Buchanan bought Hamrick’s ranch, and the 200 acres at its southwest corner completed the property that is now Elk Meadow Park. In 1949, Cole A. Means and his brother, Robert, purchased the northern portion of the meadow for summer grazing for their Texas herds. 25 known floods have occurred in the Bear Creek basin that collectively caused 45 deaths and considerable property damage. These floods occurred in 1866, two in 1878, 1885, 1886, 1893, 1894, 1896, 1903, 1907, 1908, two in 1921, 1923, 1925, 1933, 1934, 1938, 1946, two in 1957, 1965, 1969, 1973 and more recently 2013. Fire destroyed 7 businesses and 4 homes in the early hours of November 10, 1926. Residents formed a bucket brigade but wind fanned the flames, destroying a pharmacy, butcher shop, barber shop, restaurant, four homes and 2 vacant buildings. City & Mountain Views of Jefferson County is an excellent resource for the history of our area. Follow the links below to discover when your neighborhood and others hit the map. This beautiful and intimate chapel was completed in 1918 for the Douglas family's private use. The chapel, with its soaring arched ceiling and hand-leaded windows set in rosewood, is located on the second floor of the Hiwan Homestead Museum. Medlen School is a circa 1890 school house restored to the 1920's era on its original location on South Turkey Creek Road. The school was restored in 1999 through a grant from the State Historical Fund and JCHS. 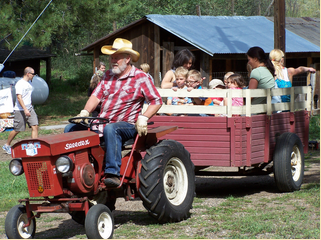 Historical "Medlen Schools Days" programs are offered during the summer months; public tours by appointment. For more information, contact 303-670-0784. In 1954 a twenty-two foot statue of the Sacred Heart of Jesus, carved by an Italian artist was mounted on an eleven foot base and erected above the Heart of Stones with 373 steps leading to the top of the Mount of the Sacred Heart. 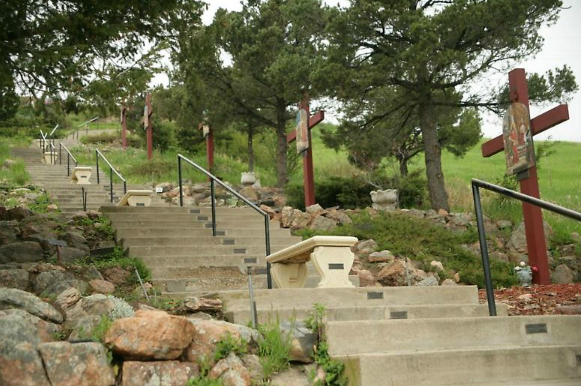 The stairway follows the path Mother Cabrini, the sisters and the children took to the top of the mountain. This stairway following the Saint’s footsteps is also symbolic of the pathway Christ took on His sorrowful way to His crucifixion and death, through the stations of the Cross. by the Roman Catholic Church, beatified on November 13, 1938, and canonized on July 7, 1946, by Pope Pius XII. She loved the foothills west of Denver and the Colorado mountains. 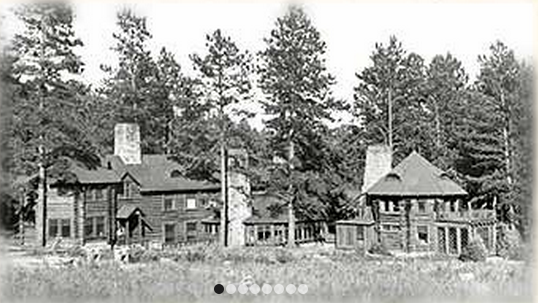 Frances X. Cabrini negotiated the purchase of land on the east slope of Lookout Mountain from the town of Golden for a summer camp for her charges at the Queen of Heaven Orphanage in Denver. No reliable source of water was known to exist on the property at that time. The only water was in a small pond next to the spring house. All of the water needed for drinking and cooking had to be brought up to the summer camp from the stream at the bottom of Mt. Vernon Canyon. In September 1912, the sisters complained to Mother Cabrini that they were dying of thirst and there was no water to be had. She answered, “Lift that rock over there and start to dig. You will find water fresh enough to drink and clean enough to wash.” The spring, which is housed in an 8,000 gallon tank, has never stopped running. Many pilgrims, through their faith, believe the water has brought healing and peace to their lives. The winding road leading to the shrine climbs to stunning views as far as the eye can see overlooking Denver and points far north, south and west. Wildlife in this peaceful place will likely greet you on your journey. 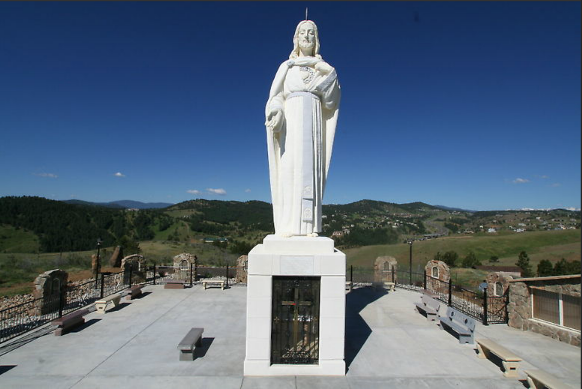 Take I-70 West to exit #259 to Hwy 40, follow the signs to the Shrine. 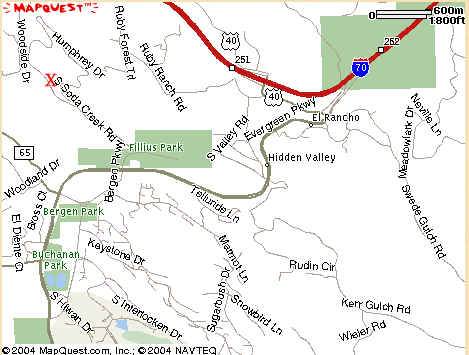 Take I-70 East to exit #256 to Hwy 40, follow the signs to the Shrine. a tourist attraction and popular landmark in Idaho Springs. discovered gold in Chicago Creek bed just below the monument. 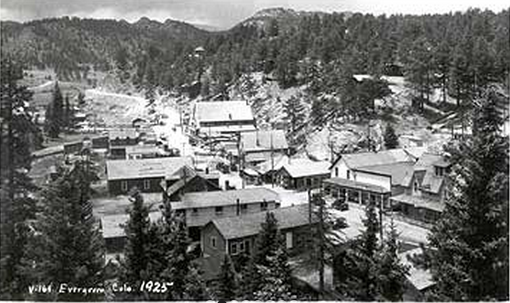 Jackson’s discovery began the Colorado Gold Rush in 1859. In Pioneer Cemetery the earliest grave marker dates from 1874. Many of the early pioneers to Idaho Springs were laid to rest here.